I was going back and forth about what to wear for Easter. We were celebrating with the husband's family like usual, and they aren't super dressy, though I do like to add in my zest regardless! I caved and bought this top from the Gibson x Living in Yellow collection at Nordstrom. 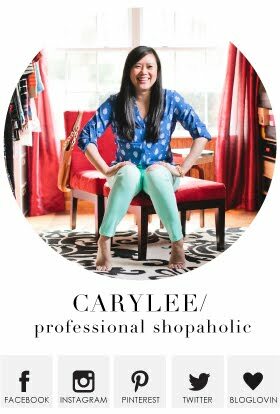 I got to meet Erin at the rewardStyle conference last year, so it's been so fun to follow along on this journey of hers. 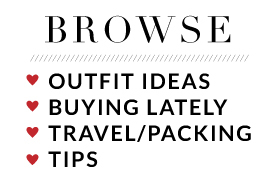 The collection is full of great basics - much of which I already had in my closet, BUT! When the second releases came out, I saw this top and, well. 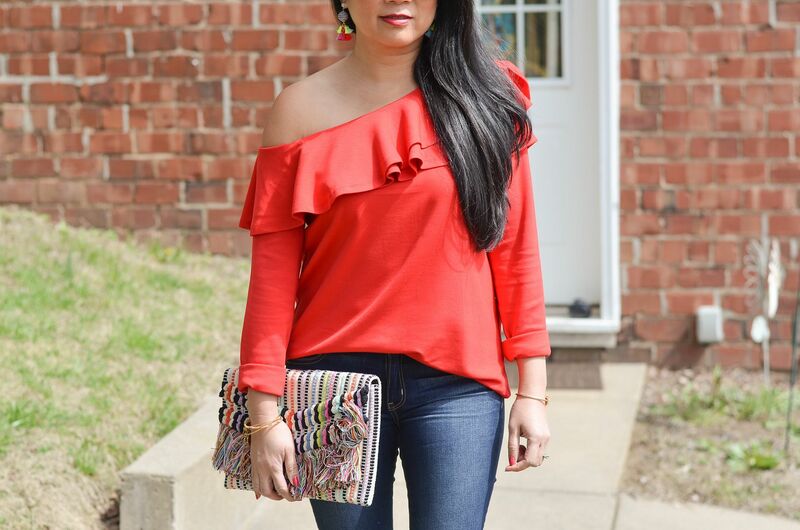 I can't have enough off the shoulder in my closet, so I decided to give it a go! 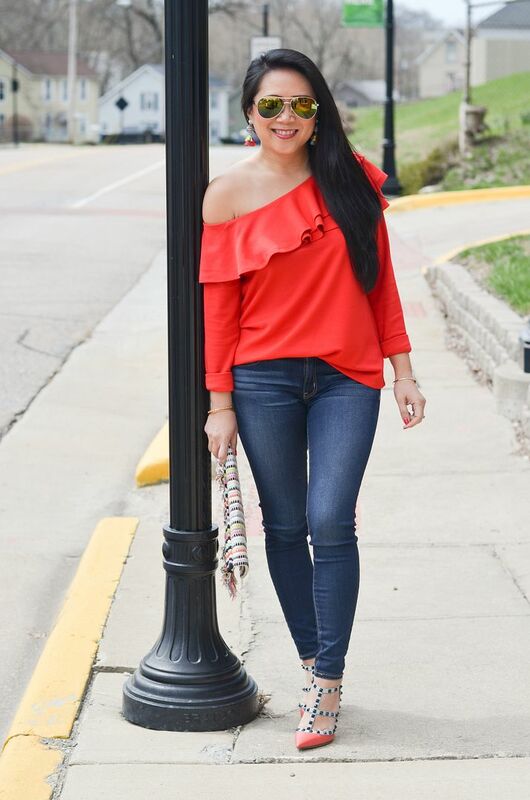 When I was laying in bed Easter morning, I remembered this top just arrived this week and the bold color was just what I was in the mood for! I honestly had no idea what to do about sizing, but I ended up ordering a small. The partial tuck helps a little with fit and proportions in the small, but I probably could have ordered an extra small and been fine with that too. Though I don't know if I could have partial tucked in an extra small so... I'm not sure! Regardless, I do like the top a lot. It's made from a really great thicker-than-a-tee shirt material - way more substantial than I was expecting it to be. It also comes in petite sizes, but honestly, even though I'm short, petite sizes always fit me weird, so I don't normally go for petite 90% of the time. I also knew I wanted to wear these earrings for Easter. I mean, how fun are they!? I was worried they were going to be heavy as some of the BaubleBar earrings I own are heavy, but these are super lightweight. 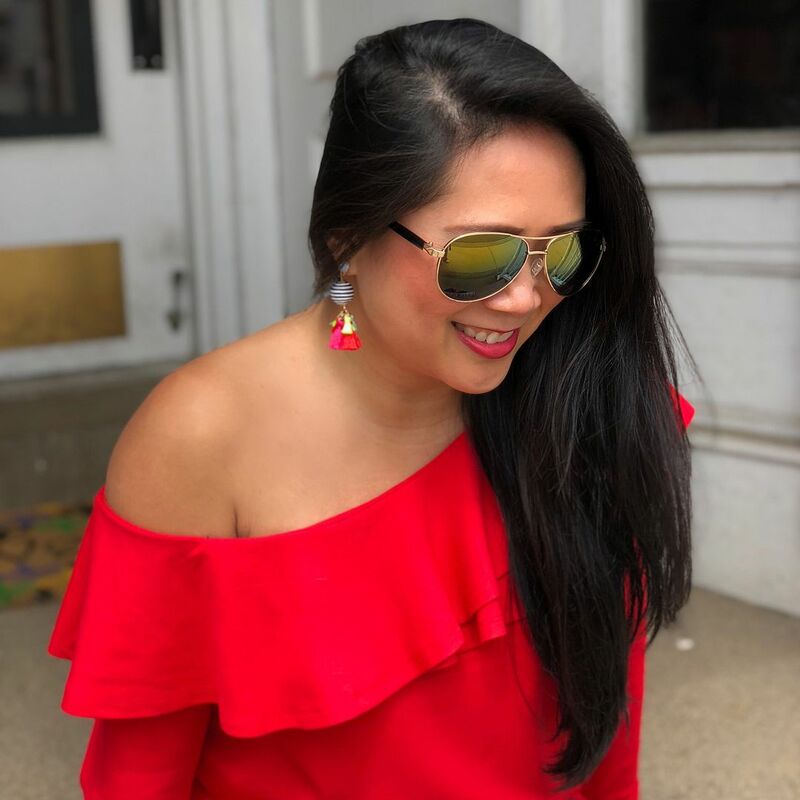 I would venture to say they are just as light as my leather earrings, and that is LIGHT! The earrings went perfectly with the shirt which made me happy. And hello, bag! 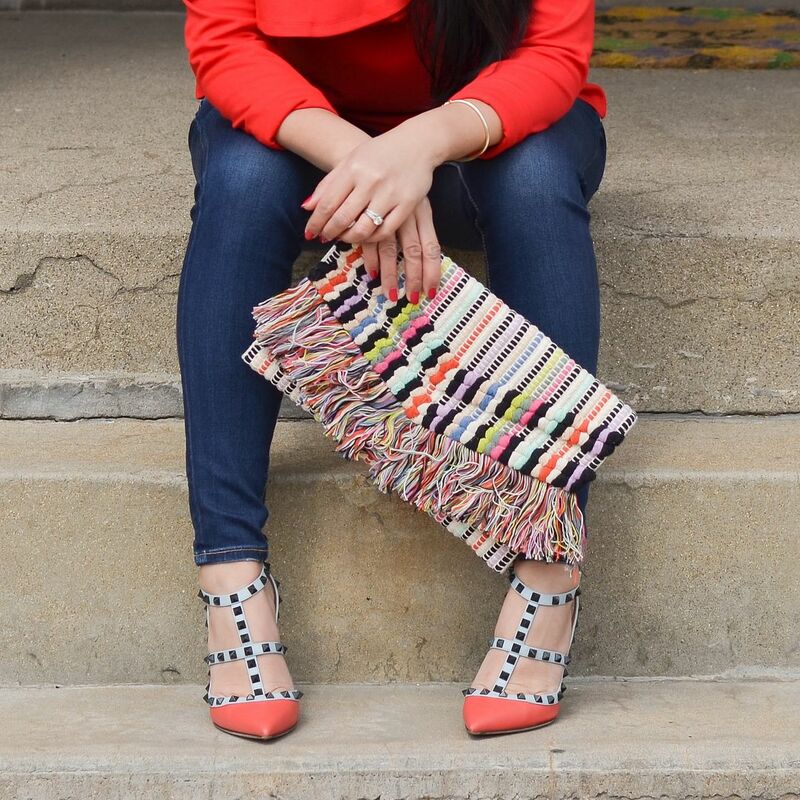 The bag and the earrings are basically distant cousins, so naturally they had to go out together. I was debating on shoes. 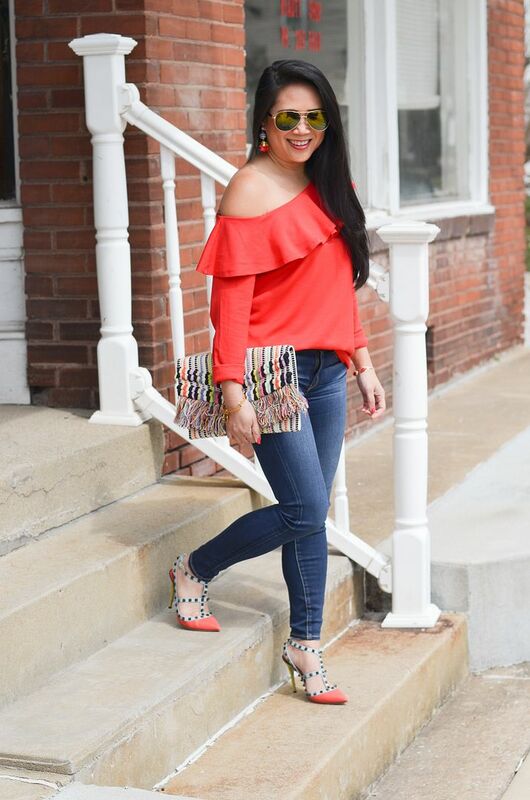 I almost went with my neon heels to pick up the neon in the earrings but THEN I realized my Rockstuds were a perfect match to the bag to the shirt to the earrings. A bit bold on bold on bold, but if you can't be obnoxious on holidays, when CAN you be obnoxious, amiright?! Overall, I give two thumbs up on this top and would suggest sizing down, definitely if you are in between sizes. I did cuff the sleeves because I liked the proportions of a 3/4 length sleeve better than the long sleeves, and admittedly, the sleeves were a tad long on me. But, like I said, I like the way the proportions looked with the sleeves rolled anyway. Whew! That is is! Hope you guys are having a great week. I have a bonus post going live tonight, so be sure you stay tuned to see what that's all about!!! 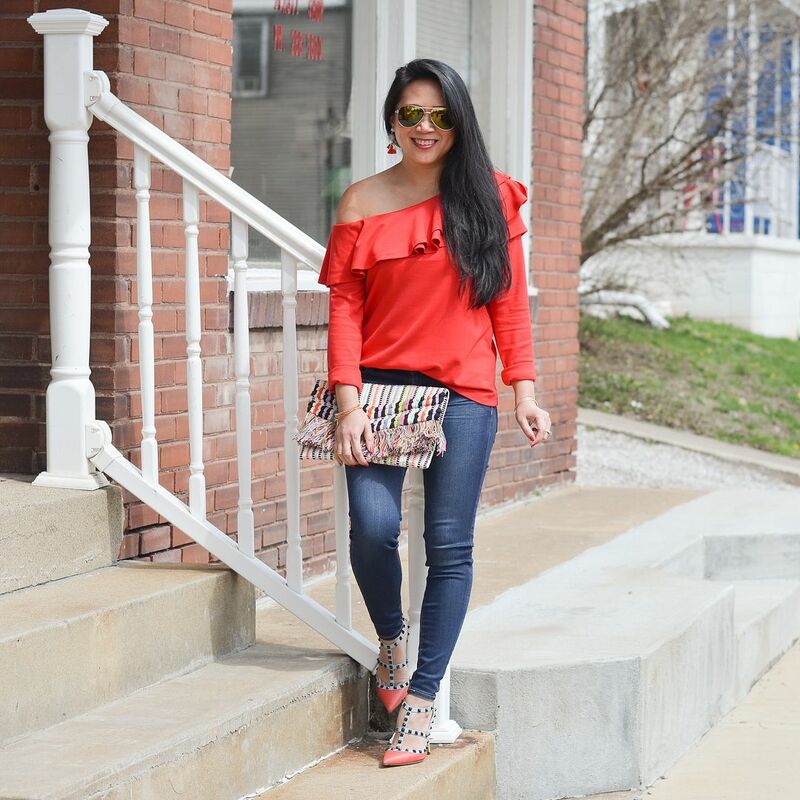 Love this fab and bold look and this top is so pretty on you. Such a GREAT outfit! love that top and bag and shoes to bits!!! SOOOO CUTE!